Alaska Peninsula Brown Bear are some of the biggest Brown Bears in the world. They demand respect as a hunter, persistence and a strong will. 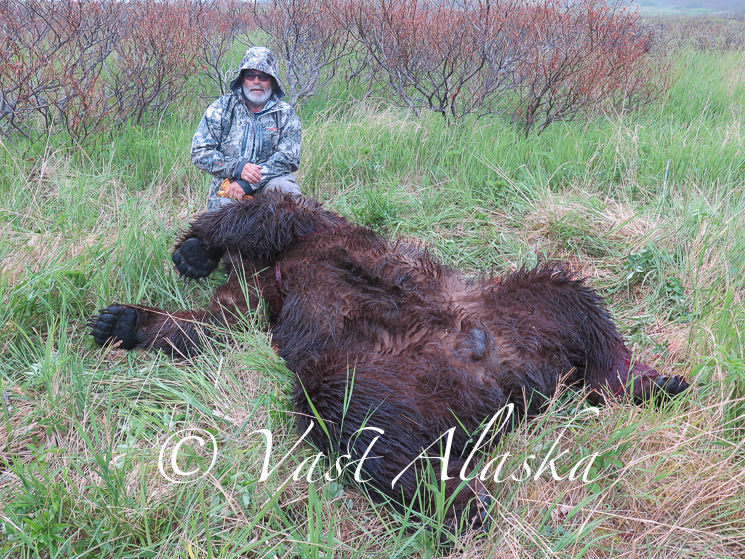 In the spring of 2018, Dale Robinson of Evolved Ballistics took his Proof Signature Rifle to Vast Alaskas Exclusive Use Concession to hunt for a trophy Brown Bear. He saw bears and he saw some wild country. But when he saw this Big Boar with a sow it peaked his interest. Then after a lengthy stalk to maneuver through brush and creeks he and his guide Aaron Wages found a vantage on the Boar. This great Bear squared 10′ 6″ and his skull was officially scored at 29 3/16. We estimated his weight at 1600# and his age at 16yrs. Although this bear is # 93 in the Boone and Crockett record book, there was never a moment when Dale Robinson questioned wether his shooting ability or his rifle would succeed. Alaska Peninsula Brown Bear will test ones patients, preparation and mettle.